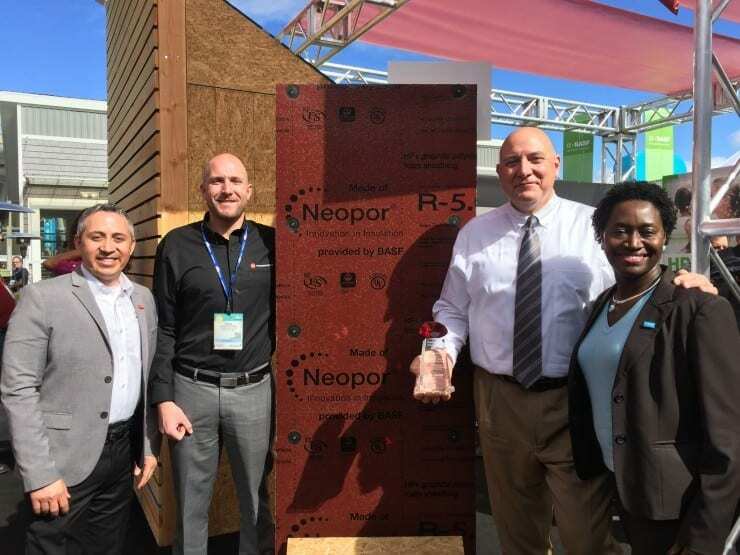 Orlando, Florida – At the 2017 International Builders Show, Progressive Foam Technologies, Inc. was recognized by BASF, the worlds largest chemical company, as the Product Manufacturer of the Year for their support in helping bringing new, innovative insulation products made from Neopor® graphite polystyrene to the marketplace. PFT was recognized by BASF alongside other influential companies in the building products industry, including Builder of the Year, Tim O’Brien Homes, and Insulation Contractor of the Year, Dakota Insulation, Inc. In addition to converting Neopor raw material into various siding insulation products in 2016, PFT provided support for the launch of the HP+ Wall System E-Series. This durable, structural assembly meets or exceeds codes while using less wood than traditional construction, resulting in exceptional energy and cost efficiency. Progressive Foam began manufacturing a new line of high-performance siding insulation products made with Neopor thermal foam in 2012, and quickly became the largest converter of Neopor in North America. Neopor® provides maximum energy efficiency, cost-effectiveness, and sustainability to insulation products. It’s unique silver-gray color and exceptional insulation characteristics are a result of high-purity graphite that reflects and absorbs radiant energy, decreasing the materials thermal conductivity and increasing it’s R-value. About Progressive Foam: Progressive Foam Technologies, Inc. is a manufacturer of foam insulation products for home exterior siding applications and is the inventor of insulated vinyl siding. The company develops premium insulation products that are energy-efficient, durable and long-lasting, and can be applied to any siding type.